As the solo architect and builder of a timber-frame home on the Continental Divide in Montana--miles from pavement and utility power--I have had to solve numerous challenging construction problems. I knew that transporting 37-foot-long purlins up my 3800', 12%-grade, boulder-strewn driveway was going to be trouble, so I logged and milled all of my own timber. Moving 300 to 700-pound posts and beams into place without even a tractor required the design and erection of a 52'-foot, hand-winch-operated gin pole and boom. Covering my cherry-stained, tongue-and-groove Douglas fir roof deck a year before being able to complete the insulation-and-steel build-up meant finding an underlayment that could withstand 12 months of southern UV exposure at 6000' elevation, with 13 cumulative feet of snow, a temperature range of -25 to +95 degrees, and average storm wind speeds of 25-35 mph with gusts to 55. I applied 30# roofing felt to cover my progress as I worked, but within two months the stuff had expanded, contracted, and edge-curled through so many cycles the slightest rain yielded a dozen interior waterfalls. I found a locally-sold synthetic roof underlayment that advertised up to 6-months UV exposure longevity, and considered applying it twice if needed, but the product's recommended use of plastic-capped roofing nails was going to necessitate extensive forstner-bit work along the underside of my insulation-frame rafters. I then found Sharkskin Ultra® Roof Underlayment on the internet. After discussing my application with Mark Strait of Kirsch Building Products, I promptly ordered five rolls. Not only was Sharkskin Ultra® Roof Underlayment easy for one man to handle, cut, and secure with standard roofing nails, but by the time I was ready to install my steel-skinned insulation frame, a year and a half had passed! The Sharkskin Ultra® Roof Underlayment looked brand new after 18 months of exposure. There were no elongated nail holes, no curled edges, and except for a very slight fading of the blue Sharkskin logo and a sprinkling of pine needles. The true test came at the 18 months later when my property got 17" of heavy, wet snow on one spring day, and it took three more days of 50-degree weather for it to finally melt and run off: NOT EVEN A DROP OF WATER FORMED ON THE UNDERSIDE OF MY TONGUE & GROOVE DECKING--on a 2:12 slope! I have a few people to thank, other than my wife, for their "help" on this project. One is Andreas Stihl, who made it possible for a man working alone to quickly turn a tree into a useful product. 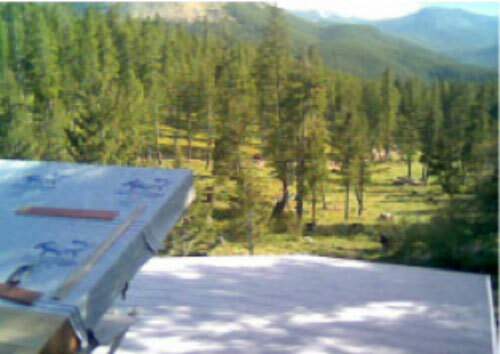 Another is Mark Strait; whose Sharkskin Ultra® Roof Underlayment protected a hand-crafted timber-frame home from the extremes of northern Rocky Mountain weather for a year and a half...as well as any "final" roof covering could have done. After this experience, I cannot overemphasize the confidence I have in the performance of Sharkskin Ultra® when used as intended: as "merely" a roof underlayment. 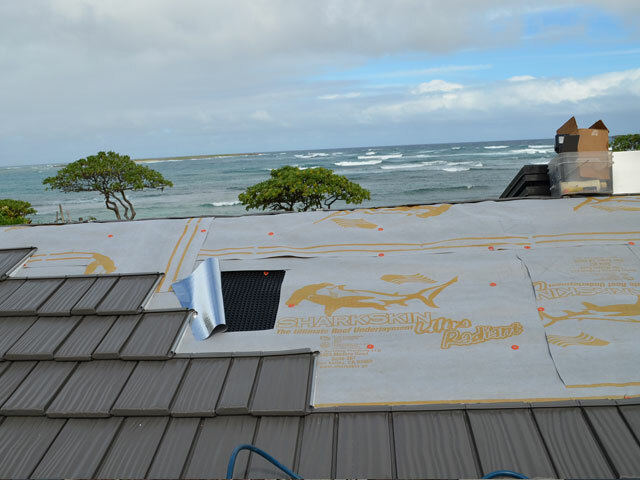 This job is a just completed re-roof and is a vacation rental on the beach in Laie (northern stretch of the northeast shoreline of Oahu). It is a simple structure with wood beams running horizontally and 2×8 T&G planks (just under 1-1/2 inch thick) running vertically (eave to ridge). The 2×8 is exposed inside and is finished with a clear stain so there is no opportunity to add insulation below the roof deck. The owner said that the heat introduced to the interior of the house from the ceiling was a big problem and he needed to find a way to ensure that it would be cooler inside the house than it was outside. With the very light structure, we had to keep the roof load (weight of the roof) to a minimum and I thought of using your Sharkskin Ultra Radiant over your polypropylene ventilating mat, over a “dry-in” layer of Sharkskin Ultra as our underlayment. The total weight of the underlayment is less than ¼ pound per square foot. We then installed the aluminum Country Manor Shake, which weighs less than ½ pound per square foot and which has a cool, infrared reflecting, Kynar 500 paint coating. The hI-R finish keeps the aluminum panels about 50 degrees cooler than conventional paints. We used 1-1/2 inch long stainless steel ring shanked nails to give us about an inch of penetration into (but not through) the roof deck. We installed our molded “Free-Floating” EPS FoamGuard inserts in each aluminum shake roofing panel. The FoamGuard, besides being a good insulator on its own, creates an additional thermal break by leaving small gap between the aluminum roof panel and the EPS. The installed roof system is tight to the roof deck, solid under foot and very easy to walk on without denting the panels. We had no trouble with any of the penetrations (skylights, hood vents and plumbing pipe vents) The owner came up on the roof during installation and is very happy with the results. He now wants us to re-roof several other properties he owns on Oahu. Thanks for introducing this great product.